Hey, everyone! It's the midseason finale of The Flash and... things are happening! Mostly quoting Christmas carol lyrics, but some other stuff as well. In my personal opinion, there wasn't a whole lot in the episode that made me think "midseason finale" (other than the Christmas stuff, which at least hinted at the time of the year). Some things happened, but none of them had the DUN DUN DUUUUNNN quality that I expect from finales — midseason or otherwise — which is different, but fine. Shows don't always have to put us on the edge of our seats just before a big hiatus, and sometimes it's nicer to end on a few curiosities and new developments that can be explored more thoroughly in the future, rather than on a huge cliffhanger. "Running to Stand Still" was an unexpectedly quiet way to usher in the winter hiatus, and that's not terrible. The episode managed to be entertaining, even though I don't feel that it used its three villains to their full potential, and some of the characters — especially Joe and Iris West — got some really good scenes. Overall, the episode had a pretty okay balance of comic book action and some personal stuff, which is not only all I really need from this show, but is also a perfect way to break down this review! Hurrah! Three of The Flash's favorite (?) villains — Captain Cold, Weather Wizard, and The Trickster — escape from prison. Solely because it adds entertainment value to the episode, it's good that the three villains who escaped all rate high on the Hamminess Scale — with Hammy Mark Hamill's Trickster character going off the freaking charts. Why have these villains escaped jail, you ask? In order to kill The Flash, of course! Because villains are incredibly single-minded and apparently no one wants to break out of jail and go on vacation to the Florida Keys afterwards, or take on a new life in a new city and become an electrician, or give all the children in the city ponies. Hero-murdering is always the first task to cross off the to-do list with these types. Sigh. Dull. With the Trickster mostly just in it for the chaos, Christmas puns, and the odd Hanukkah mention and Captain Cold not actually into it at all, the only real threat is the Weather Wizard, who actually does seem to have a grudge against The Flash and seriously wants him dead. The plot the trio hatches goes like this: dress the Trickster up as a truly unconvincing Santa Claus (seriously, on what page of A Visit from St. Nicholas does Santa laugh maniacally? How clueless are the kids of Central City?) and then distribute bombs in Christmas presents to random houses around town. When The Flash inevitably shows up, they give him an option of watching a hundred houses explode, or forfeiting his own life. Of course, Barry chooses to sacrifice himself to save the unknown families around Central City and of course, Team Flash thinks up an Option C using questionable comic book science and Cisco's top-notch brain to save Barry just in time. I have to be honest: I wasn't exactly enthralled with the Comic Book Action part of the episode. How does a show manage to set three scenery-chewing supervillains loose and avoid making it an epic event? Because this was not an epic event. It was, at best, an entertaining romp with a soupçon of theatrical ham and — while I am always a fan of these comic book shows displaying their comic book silliness (hello, exploding dreidels and questionable magnetism science) — I kind of do expect more from an episode that pulls three well-known villains out of jail for a midseason finale. This is my only real complaint about an otherwise fine episode. The big personal plot of the episode stars the West family and Iris's guilt over finding out that, yes, the second child Francine West had after leaving is indeed the son Joe never got to raise. His name's Wally, and while Iris has learned a bit about him, she struggles with the idea of telling her dad. After a pep talk from Barry, Iris decides to tell Joe and — as she predicted — he's absolutely heartbroken at the idea of having a son who never got to know him. Weirdly, though, Joe's mostly sad about Wally not having a father in his life, which — Joe, what makes you think that Wally never had a father figure, ever? You are a foster father. You understand perfectly well that blood relations aren't the end-all, be-all of family. Wally could have had any number of potential father figures to teach him any number of things — you don't know! The sadness is understandable, but you are jumping to a few conclusions, here. Anyway, like I said in the introduction, Candice Patton and Jesse L. Martin get some really good scenes out of this plot, which makes it mostly worth it despite the idea of long-lost children being kinda soap opera-y and overplayed. Iris breaking down and telling Barry how much the secret of Wally West has been weighing on her was fantastic, and Joe's quiet-but-overwhelmed reaction to the truth was heartbreaking. I do hope that the next half of the season has more of the West family in it, especially since Iris has been woefully underutilized so far and I miss her. Thankfully, things seem to end on a positive note for the Wests, and when the secret is finally lifted from Iris's shoulders, she does seem to have reached a kind of peace about it all. Wally West shows up at the door of the West household, as is the wont of long-lost children, and he's welcomed in to celebrate Christmas with the weirdest family ever. Congrats on unknowingly saddling yourself with more baggage and drama than any person ever needs, Wally. Merry Christmas! Slightly more in the background of the episode is Barry dealing with his hatred/distrust of ParaWells — a lingering side effect of his hatred of Thawne-Wells. It gets a tiny mention to Iris, just before Iris starts talking about how much it's been hurting her to keep Wally West a secret from her father. After dealing with Patty Spivot's backstory, and talking her out of straight-up murdering Weather Wizard (out of revenge for him killing her father in a bank robbery), Barry realizes that holding on to hatred for too long can be damaging. Toward the end of the episode, Barry unloads his feelings about hating ParaWells — through a soundproof glass window in S.T.A.R. Labs, so that Barry can talk freely without ParaWells ever knowing what he's said. At the end of the monologue, Barry invites "Harry" to celebrate Christmas with the rest of the team, but he declines because he doesn't want to celebrate the holidays without his daughter. And finally, we end on ParaWells briefly reuniting with said daughter. When Jesse is taken away again by Zoom, ParaWells breaks down and agrees to something apparently presented to him off-screen at some point: he'll help Zoom steal The Flash's speed. I know Barry wasn't exactly festive throughout the whole episode but, come on, how could I resist a GIF of a Christmas puppy? 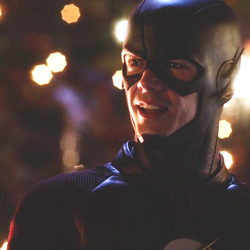 "Merry Christmas," says the evil, villainous speedster bent on the destruction of our hero. "They didn't have any Green Arrow dolls." One: I bet it's because he keeps changing his freaking name so no one knows how to market it, and two: how sad is it that there probably aren't any Green Arrow dolls in Star City, either? On account of Star City being devoid of joy, light, and childhood whimsy. I love that Barry starts in on talking about his emotions and misses the moment when Iris starts crying. Like, pay attention to your best friend, Barry! Jenn raised a point on Twitter that the Flarrow universe has a "secret kids" theme going on this season. What's up with that? Also, I feel like Oliver and Iris should have a talk about how to deal with keeping secrets from loved ones. "Earth-2 has The Godfather?" "Every Earth has The Godfather, Vito." Barry and Iris once stole Joe's convertible and crashed it into a tree? Fun! "Didn't Barry tell you? I had a rough childhood." "Everyone in this room had a rough childhood. Get over it." Ha! Iris is cool. I didn't notice the subtle sleigh bells in some of the background music until my second watch. Fun touch, The Flash. The "Wizard's Wand" really does look like a giant version of the sonic screwdriver from Doctor Who. "Um, guys? He's flying." Hilarious delivery from Grant Gustin. Barry jumping onto the blades of a helicopter was really cool! I like that the show can still have fun with the superspeed thing. "Your toys? Give them to me." ParaWells can never replace Cisco as my favorite, but he's getting up there. "I always said that one day, I would give this to my son." Joe... didn't you say you didn't really like that watch? And that it was broken? Why... Oh, never mind. Barry's speech to ParaWells was wonderful in both words and delivery. You go, Grant Gustin. The "Earth-2 doesn't have [thing] — just kidding, it does!" running joke between Caitlin and Jay was only done twice but I hope it never happens again because it was really annoying. Well, that's it for The Flash: 2015 Edition! See you guys again in the new year, and happy holidays!